Sometimes your geometry teacher may spice things up a bit with complicated polar coordinates — points with negative angles and/or radii. The following list shows you how to plot in three situations — when the angle is negative, when the radius is negative, and when both are negative. When the angle is negative: Negative angles move in a clockwise direction. Visualizing simple and complex polar coordinates. and then find the location of the radius, 1, on that line. Some teachers prefer to teach their students to move right along the x- (polar) axis for positive numbers (radii) and left for negative. Then you do the rotation for the angle in a positive direction. You’ll get to the same spot with that method. in the figure. Because the radius is negative, move along the left x-axis 1/2 of a unit. Then rotate the angle in the positive direction (counterclockwise) pi/3 radians. 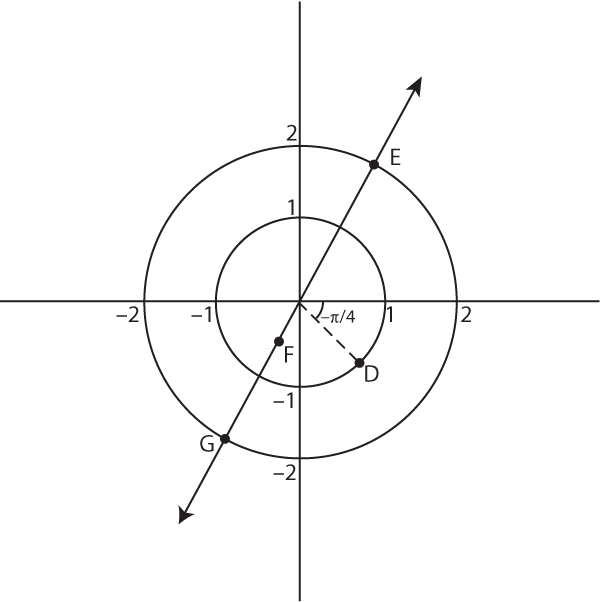 You should arrive at your destination, point F.
When polar graphing, you can change the coordinate of any point you’re given into polar coordinates that are easy to deal with (such as positive radius, positive angle).